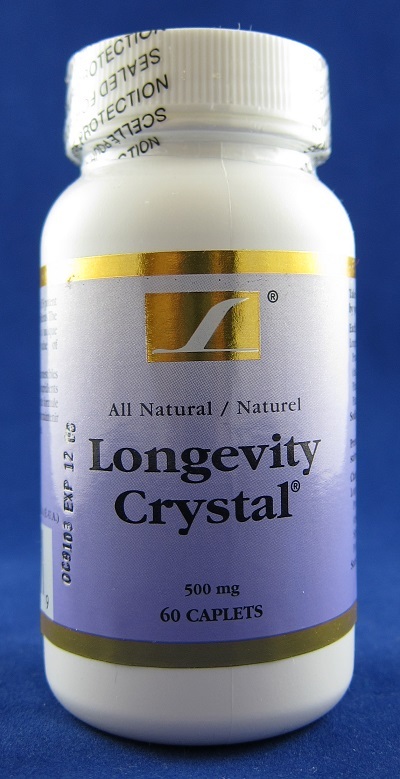 Longevity Crystal (60 tablets)- Save-On Nutrition Centre Ltd.
"The average life expectancy of many species has been increased by more than20% by adding antioxidants to the diet...This increase is equivalent to raising the human life span from the present 76 years to 95 years." This product created by Dr. Arthur H.K. DJang with a team of American and Chinese physicians and scientists after many years of cumulated research with initial clinical application in 1988. It was specially formulated with extracts containing bioflavonoids, polyphenols and plant saponins in addition to essential amino acids, vitamins and minerals. Centuries old usage of these herbs for food and drink in China, Korea and Japan, plus recent documented basic research and clinical application has further verified its usefulness and safety. It's clinical effectiveness on elimination of excess free radicals generated internally or through external sources, which causes aging, cancer, heart attacks, stroke, cataracts and other serious disabling conditions. In general, reduced fat (ca 20%) and total calories intake, ingesting more fruit and vegetable, no smoking, limited alcohol consumption with moderate exercise plus supplement with Longevity Crystal and other antioxidants, one can extend life expectancy for one hundred years. A useful, happy, productive, self-realizing experience can be fulfilled with joy and anticipation.